Lazy Worm Farm Is Swarming with Baby Worms! Well, a small swarm... more than I could count... (ran out of fingers and toes). Looks like I screwed up in reverse with my half fast worm farm! Something has to be going right or they would be sooooo many tine little worms. Haven't gotten into full on vermicomposting yet. Probably will when I finish of the SIP's and racks I am making and get the mix thing straitened out. Earlier this year I drill a bunch of holes in the bottom of a 5 gallon bucket, filled it with mulchy compost and added some kitchen scrapes and recruited a bunch of red wiggler type worms out of my compost pile the take up residency in the bucket. Then I kept the bucket buried to the top in my "curing compost pile". Thinking was that if the conditions were better in the bucket than outside the bucket they would stay and and process the mulchy stuff and kitchen scrapes in an easy to remove container. If things went south in the bucket they could exit at will over the top or out the holes in the bottom. When frosts started becoming common, I brought the bucket into the basement and put it on a lid to catch the escapees and any liquid oozing out the bottom. No escapees yet and no liquid, just a tiny bit of black granular stuff that looks like very finished compost. A couple of weeks ago after to turned the contents of the bucket by transferring the compost out, picking out the worms and then putting the compost back into the bucket one handful at a time and adding the worms back in near the top, I added half of a baked potato half and buried in under the last inch of material to go back into the bucket. That's where the baby worms are - just under the papery skin of the potato. No potato left, just the papery skin. Added a pot's worth of cooled coffee grounds because I think they like those too and the potato was gone, again about an inch under the surface. Didn't really want to disturb things too much cause the little worms look so fragile. I'm guess from what I have read that I just keep adding food stuffs and if it starts to smell, I cut back on the food and let them catch up. Am going to start freezing some of the veg scrapes and then thawing them to room temp before feeding it to the worms. Other than getting an actual worm container, the correct worms, a paper shredder ... , is there anything I should be doing or watching out for? The couple of times the surface started to dry out I gave it a heavy misting with distilled water. Basement is pretty much a constant 60*F or so. Re: Lazy Worm Farm Is Swarming with Baby Worms! Worms lay eggs on leaf litter (and other organic matter). Even if all the adult worms die, some of the kids will repopulate from that kind of trove. Most of the the adults are still there. Did sort of a census when I brought the bucket inside. Had about a measuring cup of worms. Really want to go digging through it and empty the bucket one handful at a time, but those little worms look so fragile. Thinking I will keep adding stuff and when the are bigger maybe split the contents of the bucket between two buckets. Either way I should end up with some good stuff to add to my container mix. I used to use direct sunlight and a wheelbarrow to remove worms from bedding. I would shovel a wheelbarrow full of bedding and park it in sunlight. The worms would crawl away from light towards the bottom of barrow. Pluck off worm free media, repeat. Eventually I would quit and return that remainder (about 1/4) to their bin. Outside in direct sun and +50*F or so..... doubt it will be happening here much till spring. Think I will try chasing them toward the bottom of the bucket with an incandescent flood light or something when the little guys get a little bigger. They really went after the coffee grounds and some of the adults actually are at the grounds too. No smell, so I added a whole, frozen-n-thawed banana peel. If you dump them out on a screen or mesh over a darkened container, they will burrow down and fall through as the media dries, so thats another way. With babies and a small amount, I used my kids' plastic sand shifter which fit exactly over a black plastic nursery pot. For adult worms and bigger amount I use a (currently unused/ not used by cats in over 10 years) cat litter shifting tray. (Chuckles) Keep them in the bucket by making it a desirable place to be. Get them out of the media by making it uncomfortable. Doesn't get much simpler. Funny thing is I just built a screen frame to fit over my SIP containers. Guess I am going after some 1/4" hardware cloth. Can I just jump in here? I can't remember if I have my own vermicomposting thread. I looked in on my cobbled together stacked worm bins in the garage the other day -I hadn't even thought about them for about a month - and each feed tray/vermicast tray combo was pretty much teeming with smallish worms inside and under the feed tray. Most of the feed tray volume had gone down by about 1/2. I gave them some veg scraps from making curry, soup, and fruit salad over the past couple of days. Im sure there are big worms hiding in there, too. But I was happy to see the little ones because I will be putting them in the uppotting mix once seed starting is underway. I just wanted to show you can be as haphazard as this and at least not kill the worms. With these 4 container combos, I'm not looking for a whole lot of wormcasting production or kitchen scrap processing, but just a way to overwinter the worms and keep them accessible so I don't have to go and buy more. The small amount of vermicast will be used to add microbes/probiotics/nutrients to the seed starting and seedling uppoting mix. I also add the baby worms -1 each- to the uppotting containers as much as possible. ...I noticed the center bottom container was drier than it should have been and added some water to the feed tray and bottom tray. I also loosened the bottom tray contents to aerate for each of the tray and bucket combos. I don't have a bin I can separate so I don't feed the worms for a couple of weeks before the harvest. 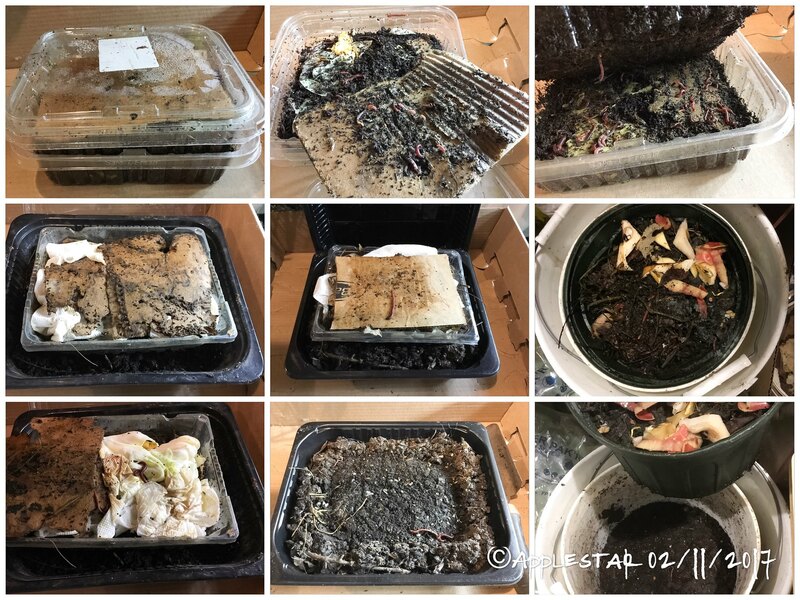 I use a tray and separate the compost into piles. I can usually make 3 or 4 piles. I work on one pile at a time sorting out the worms from the compost. The first pile will have the most worms all over the place, but by the time I get to the last pile, most of the worms have migrated to the bottom of the pile and have balled up. I put new bedding in the bin and put the worms back with some food. After the vermicompost is sifted out I leave that bucket in the shade for a week. It will need to be sifted out again to catch any remaining eggs and hatchlings. Good plan! What I've done in the past is to dump them out in a screening web tray -- one I have for soilblocks with solid sides and (I think) 1/2" square holes -- over an empty solid tray with a layer of moistened coir or strips of paper, and expose the surface to sunlight or strong light., then go do some other stuff. When I come back, good many of the worms will have migrated to the bottom tray. You still have to pull out the ones hanging from the holes and hunt out the ones hiding in the corners. I'm starting my first worm farm!